Nathaniel A. Raymond speaks about humanitarian disasters in the networked age at the Law School on Tuesday. 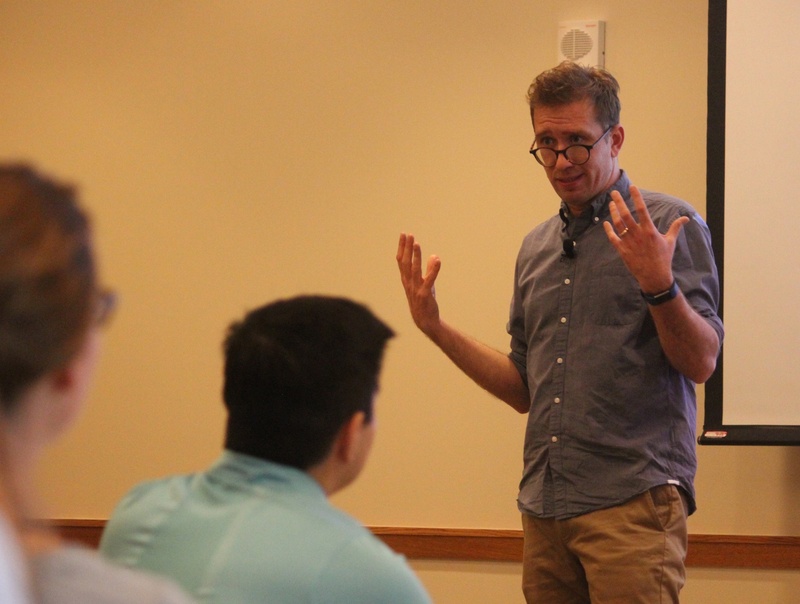 Nathaniel A. Raymond, director of the Signal Program on Human Security and Technology at the Harvard Humanitarian Initiative, called for the refocusing of humanitarian relief from technology and data science back to the issue of human rights in a lecture at the Law School Tuesday. “I frankly think we need coders and hackers significantly less than we need lawyers,” Raymond said, adding that students at the Law School can “articulate the problems and the gaps” in current humanitarian efforts. He began his talk with a discussion on the history of humanitarianism, from its roots in the Red Cross and the Geneva Conventions to the proliferation of non-governmental organizations in the late 20th century. “There is in the context of conflict an increasing role of non-governmental organizations playing a supposedly neutral humanitarian actor role to meet need when governments [or] war prevent delivery of systems,” he said. Raymond then launched into the focus of his talk—how data and information technologies have transformed humanitarian responses. Raymond said an increasing reliance on digital data to inform humanitarian responses have led to an uneven distribution of relief efforts. He spoke about seeing this “digital invisibility” first-hand in Biloxi, Mississippi after Hurricane Katrina, where white communities received more comprehensive aid than black communities. “There was a racial and economic disparity in terms of how federal and state authorities were seeing the population based on whether or not they had barriers to their connectivity. For me, everything I’ve done in my life since then was really related to that moment,” Raymond said. Raymond concluded his talk with a call to action for future leaders in law to address the problems regarding data and technology in humanitarianism. Ying Li, a student at the Law School who attended the talk, reflected afterwards about the recent popularization of digital technology in humanitarian work. “When I learned international humanitarian law, we covered how to coordinate all the resources from all the stakeholders, private and public, to better respond to crises," she said. "But back then, in 2013, we didn’t touch upon digital philanthropy." Suchana Seth, a visiting fellow at the Berkman Klein Center, echoed similar thoughts on the role of technology in her work.